ESA has been working with Old St. Patrick’s church for years and has designed and renovated several buildings on their campus. 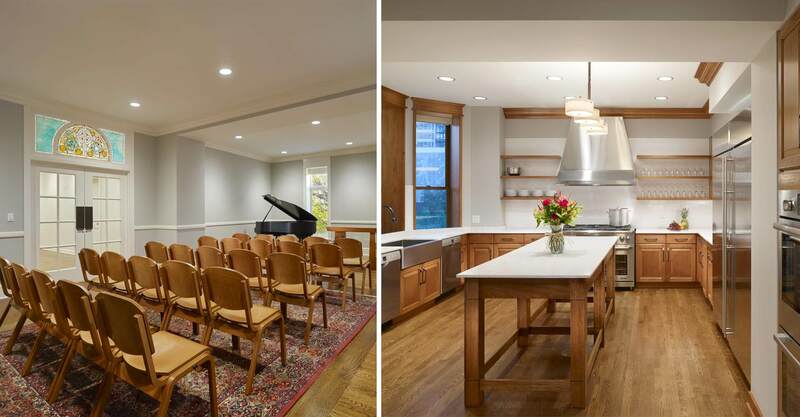 We were recently tasked with an extensive renovation of the century-old rectory to meet the current and future needs of the church, bring it into code compliance and create a more functional and efficient space. The interior of the existing rectory was demolished, leaving only the front façade and load-bearing walls. The structure was also expanded to take advantage of vacant space on the lot to accommodate a new chapel for weekday masses. The program also includes a top floor residence, which can accommodate up to 3 priests, a large kitchen and dining room for new member dinners, a conference room and a sacristy which services the adjacent church. ESA also designed several pieces of furniture for chapel and the large central island in the kitchen. The new rectory is an important piece of the Old St. Patrick’s campus. It provides a major upgrade in living space for the priest, but most importantly acts as community hub for the church and its parishioners.